Dark Places is part of the Overt Research Project, run by Office of Experiments. This work was first shown publicly at the exhibition 'Dark Places' curated by Office of Experiments with John Hansard Gallery, Arts Catalyst and SCAN in 2009-10. This site was publicly launched on 13th December 2010. In developing the work for this exhibition, we imagined the construction of an alternative and experimental knowledge source that in turn maps all other sites of knowledge, as they exist in the UK Landscape. A 'Field Guide to Dark Places' is the first of these experimental resources, and aims to draw on and develop responses to the vast infrastructure of the techno-scientific and industrial / military complex, probing aesthetic, political and philosophical questions around spaces that are inaccessible or in some cases secret. (for reasons varying from simple understanding to physical and security issues - the performance as the writer Foucault would state of 'heterotopias'). Whilst our own researchers, specifically Neal White and Steve Rowell, largely conducted research for the Dark Places Field Guide, our aim now is to extend the scale of this work by opening up this resource to enthusiasts, amateur scientists and urban explorers. If you would like to take part, we ask that you attend a physical event, as critical to our work is the link between the imaginary and the real - often confounded by pure virtual experience. We have run a number of events at which you can register to become an official Overt Researcher. These have most frequently included 'Critical Excursions'. The form of a Critical Excursion is experimental and varies depending on context. Recent Critical Excursions have included an intellectual and emotional tour of physical sites by vehicle "Cold War Spaces of Secrecy and Technology' around Southampton, with around 50 attendees (and hundreds more disappointed- sorry!). We utilised an experimental mix of factual, historic -informational and conspiracy video / audio on board a coach whilst moving around physical sites. 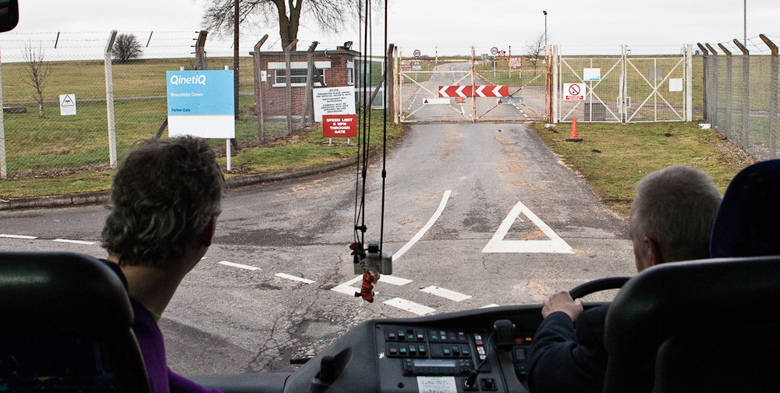 Exceptional highlights being entry into a former Nuclear Bunker, a drive-past of Porton-Down and lunch and lecture at ISSEE (International School of Security and Explosives Education) at the Department of Homeland Security. More information and responses to the Critical Excursion are available at the following links. Geoforum Editorial - Theoretical Framing by Dr Gail Davis for the Scholarly Journal Geoforum. In the summer we ran a Critical Excursion in the form of a one day workshop "Experimental Ruins", which included a walking tour and investigation of abandoned laboratories, a foreground to the next stage of the Overt Research Project. "We are aware of the effect of social, technological and scientific progress as a form of rapid geology in urban / suburbia, with new sediments concealing old forms, as new systems and structures continually replace the old. This is the progressive effect of a technical and rational culture, the search for increasing traction on space and matter, as virtual spaces take the place of the indeterminate traces of human and animal life. Models replace organisms, simulators supplant laboratories, and movement of atoms are integrated into networks of bits. To explore experimental ruins is to engage with the range of knowledge, materials and sites relating to such developments and their histories. From experimental practices, to standard research methods, from archives to archaeology, from conspiracy theory to hard scientific fact, we want to use this material to explore the realities and myths that are the remainders of progress." If you would like more information on how to get involved in Experimental Ruins or to attend a future 'Critical Excursion', please please contact us using the Enquiries form at the bottom of the page. The Dark Places Field Guide was commissioned by The Arts Catalyst, who provide ongoing support to Office of Experiments and help us to keep the Overt Research Project as autonomous as possible from institutional processes. Dark Places was co-curated by Office of Experiments with Stephen Foster and staff of John Hansard Gallery, SCAN and The Arts Catalyst. The Office of Experiments’ Overt Research Project is also supported by UCL Department of Geography and The Media School, Bournemouth University. The Overt Research Project database has been implemented and realised by Lisa Haskell using Drupal. Design by Mark Shufflebottom.